다운로더블 제한수신시스템에서 다수개의 유료 채널 방송의 멀티 채널 녹화를 위한 다중 스트림 암호화 방법, 다중 스트림 암호화 장치 및 호스트 장치가 개시된다. Down to double the conditional access system, a plurality of pay-per-view multi-stream encryption method for multi-channel recording of a broadcast from, a multi-stream encryption device and a host device are disclosed. 본 발명의 일실시예에 따르면, 멀티 채널에 대한 디스크램블링된 트랜스포트 스트림(transport stream)을 다중 스트림으로 멀티플렉싱하고, 멀티플렉싱된 다중 스트림을 암호화하여, 암호화된 다중 스트림을 멀티 채널에 대응하여 디멀티플렉싱하여 다수 개의 프로그램을 녹화할 수 있다. According to one embodiment of the invention, by multiplexing the descrambled for the multi-channel transport stream (transport stream) with a multi-stream, encoding the multiplexed multi-stream, in response to the encrypted multiple streams for multi-channel de-multiplexing and you can record multiple programs. 본 발명은 케이블 방송 시스템에서의 다중 스트림을 암호화하는 방법, 암호화 장치, 이를 포함하는 호스트 장치에 관한 것으로, 더욱 상세하게는 다운로더블 제한수신시스템에서 다수개의 유료 채널 방송의 멀티 채널 녹화를 위한 다중 스트림 암호화 방법, 다중 스트림 암호화 장치 및 호스트 장치에 관한 것이다. The present invention is a multi for the method, an encryption device, relates to a host device comprising the same, and more particularly, to double the conditional access system, a plurality of pay multi-channel recording of the channels broadcast in the down to encrypt the multi-stream of the cable broadcasting system stream encryption method, to a multi-stream encryption device and the host device. 본 발명은 지식경제부 및 정보통신연구진흥원의 IT성장동력기술개발사업의 일환으로 수행한 연구로부터 도출된 것이다[과제관리번호: 2007-S-007-02, 과제명: Downloadable 제한수신 시스템 개발]. The present invention was derived from done as part of the Ministry of Knowledge Economy and Telecommunications Research Institute IT growth Technology Development Research [Problem Management Number: 2007-S-007-02, Project title: Downloadable Conditional Access System Development]. 제한수신시스템(CAS, Conditional Access System)은 방송 프로그램에 암호를 삽입하여 시청이 허가된 가입자들에 대해서만 유료 방송 프로그램을 시청할 수 있는 권한을 부여해주는 시스템이다. Conditional access system (CAS, Conditional Access System) is a system that grants permission to watch a pay TV program viewing is allowed only to the subscriber by inserting the password in the program. 현재 디지털 케이블 방송에서는 유료 방송 서비스를 제공하기 위해서는 CA(Conditional Access) 응용의 구현 형태에 따라 대부분 스마트 카드 또는 PCMCIA 카드 형태의 케이블카드를 이용하고 있다. In order to provide the current pay-TV services in digital cable TV is the most used form of a smart card or PCMCIA card cable card according to the implementation of the CA (Conditional Access) applications. 그러나, 종래의 제한수신시스템에서는 CAS 소프트웨어(또는 CAS 클라이언트 이미지)를 스마트 카드 또는 PCMCIA 카드를 통해 오프라인(off-line)으로 배포함으로써, 제한수신시스템의 결함 발생 시에 카드를 재발급하는 과정에 일정 시간이 소요되어 상기 결함에 대한 신속한 대처가 어렵고, 상기 카드의 재발급으로 인한 추가 비용이 소요된다는 문제점이 있었다. However, the receiving conventional restriction system by deploying offline (off-line) of the CAS software (or CAS client images) through a smart card or PCMCIA card, calendar, the process of re-issued cards at the defects of the conditional access system time this is difficult to take prompt action on the fault, there was a problem that the additional costs caused by the replacement of the card required. 이러한 단점을 극복하고자, 최근 양방향 케이블 통신 네트워크를 기반으로 다운로드 가능한 제한수신시스템(DCAS, Downloadable Conditional Access System) 기술 개발이 이슈가 되고 있다. To overcome these disadvantages, recently a two-way cable downloadable conditional access system (DCAS, Downloadable Conditional Access System) technology based communications network is becoming an issue. DCAS 기술이란 종래와 같이 CAS 사업자가 스마트 카드 또는 PCMCIA 카드에 선정된 CAS 소프트웨어를 설치하여 유료방송 서비스를 제공하는 것이 아니라, 셋탑박스(set-top box)에 상기 CAS 소프트웨어가 설치될 수 있는 보안모듈을 탑재하여 상기 양방향 케이블 통신 네트워크를 통해 상기 CAS 소프트웨어를 포함한 보안모듈 프로그램의 결함이 발생하거나, 상기 보안모듈 프로그램의 버전 업데이트와 같은 상황에서 용이하게 상기 보안모듈 프로그램을 갱신할 수 있도록 하는 기술이다. DCAS technology is a security module in the CAS software can be installed on, not by the CAS operators as conventionally install the CAS software selection on a smart card or PCMCIA card provides pay-TV services, STBs (set-top box) to a technique that enables to easily update the security module application in situations such as in the version update of the two-way cable communication through the network to be defective in the security module program generation including the CAS software, or the security module program mounted. 최근의 셋탑박스는 단지 방송 데이터를 처리하는 기능 외에 동시에 한 채널의 프로그램을 시청하면서 다른 채널의 프로그램을 녹화하여 편리한 시간에 시청하는 DVR (Digital Video Recorder) 기능이 제공되거나, 홈 네트워크를 이용하여 PC 또는 다른 단말에서 시청하는 기능이 제공되기도 한다. Recent set-top box, or just give a DVR (Digital Video Recorder) function to watch while watching the functions of the channel program at the same time, in addition to handling the broadcast data by recording a program on another channel at a convenient time, using the home network PC or it is also provided with a function to watch at a different terminal. 특히, 다운로더블(Downloadable) 제한수신 시스템에서는 셋탑박스에 저장(녹화)되거나 홈 네트워크를 통해 외부로 출력되는 방송 데이터에 대해, 방송 사업자 가 관리할 수 있는 저장 매체 혹은 장치에서만 방송 데이터가 사용될 수 있도록 하는 ASD(Authorized Service Domain)를 정의하고 있다. In particular, down to the double (Downloadable) conditional access system, and saved (recorded) to the set-home through the network for the broadcast data output to the outside, the broadcasting company to manage the storage medium, or only broadcast data may be used devices which the (Authorized Service Domain) ASD so that it defines. 이러한 환경에서 셋탑박스는 하나의 방송 프로그램이 아닌 동시에 다수개의 프로그램을 저장하는 기능이 요구되고, 동시에 다수 개의 프로그램을 녹화 위해서는 탑재된 보안모듈에서 다중 스트림의 암호화 처리가 요구된다. In this environment, the set-top box has a function of storing a plurality of programs at the same time instead of a single broadcast program is required, at the same time, the encryption processing in the multi-stream in a security module installed to record a plurality of programs is required. 본 발명은 다운로더블 제한수신 시스템을 지원하고, 멀티 채널을 통해 수신되는 다수 개의 프로그램을 녹화 가능한 호스트 장치를 제공하고자 한다. The invention supports the double conditional access system to down, and to provide a possible record a plurality of programs received through the multi-channel host device. 또한, 본 발명은 멀티 채널에 대한 디스크램블링된 트랜스포트 스트림(transport stream)을 다중 스트림으로 멀티플렉싱하고, 멀티플렉싱된 다중 스트림을 암호화하여, 암호화된 다중 스트림을 멀티 채널에 대응하여 디멀티플렉싱하는 다중 스트림 암호화 장치 및 그 방법을 제공하고자 한다. In addition, the present invention is the descrambled transport stream to the multi-channel (transport stream) for multiplexing of multiple streams, encryption of the multiplexed multi-stream, demultiplexing corresponding to the encrypted multiple streams for multi-channel multi-stream encryption to provide a device and method. 상기의 목적을 이루고 종래기술의 문제점을 해결하기 위하여, 본 발명의 일실시예에 따른 호스트 장치는 멀티 채널을 통한 통신 데이터를 수신하여 상기 멀티 채널에 대한 트랜스포트 스트림(transport stream)을 복조하여 출력하는 변조부, 상기 변조부로부터 출력되는 상기 멀티 채널에 대한 트랜스포트 스트림을 수신하여 디스크램블링하고, 상기 디스크램블링된 트랜스포트 스트림을 암호화하는 보안 모듈부, 및 상기 암호화된 트랜스포트 스트림을 레코딩하여 저장하는 DVR 저장부를 포함할 수 있다. To achieve the above object of solving the problems of the prior art, a host device according to an embodiment of the present invention is output by receiving the communication data via the multi-channel demodulating a transport stream (transport stream) on the multichannel modulator, stores the descrambled by receiving a transport stream for the multi-channel output from the modulator, and recording security module unit, and the encrypted transport stream to encrypt the descrambled transport stream DVR storage may include portions that. 본 발명의 다른 일실시예에 따른 다중 스트림 암호화 장치는 멀티 채널에 대한 디스크램블링된 트랜스포트 스트림(transport stream)을 다중 스트림으로 멀티플렉싱(multiplexing)하는 멀티플렉싱부, 상기 멀티플렉싱된 다중 스트림에 대한 TS(transport stream) 패킷을 필터링하는 필터부, 상기 멀티플렉싱된 다중 스트림 을 암호화하는 암호화부, 상기 암호화된 다중 스트림을 상기 멀티 채널에 대응하여 디멀티플렉싱(demultiplexing)하는 디멀티플렉싱부, 및 상기 멀티 채널에 대한 상기 디스크램블링된 트랜스포트 스트림에 대한 PCR(packet clock reference)의 지터를 보상하기 위한 클럭 카운터를 발생하는 카운터부를 포함할 수 있다. Multi-stream encryption apparatus according to another embodiment of the present invention is descrambled for the multi-channel transport stream (transport stream) for multiplexing (multiplexing) multiplexing unit for a multi-stream, TS (transport for the multiplexed multi-stream stream) filter unit, the encryption unit for encrypting the multiplexed multi-stream to filter the packet, the encrypted multiple streams in response to the multi-channel de-multiplexing (demultiplexing) demultiplexing unit, and wherein for the multi channel D It may include a counter for generating a clock counter for compensating for jitter in the PCR (reference clock packet) for the scrambled transport stream. 또한, 본 발명의 또 다른 일실시예에 따른 다중 스트림 암호화 방법은 멀티플렉싱부를 통하여 멀티 채널에 대응하는 트랜스포트 스트림을 다중 스트림으로 멀티플렉싱하는 단계, 상기 멀티플레싱된 다중 스트림의 TS(transport stream) 패킷을 필터링하는 단계, 상기 멀티플렉싱된 다중 스트림을 암호화하는 단계, 및 상기 암호화된 다중 스트림을 상기 멀티 채널에 대응하여 디멀티플렉싱하는 단계를 포함할 수 있다. In addition, a further multi-stream encryption method according to another embodiment includes the steps of: multiplexing the transport stream into multiple streams, TS (transport stream) of a multi-stream, the multiplexing corresponding to the multi-channel by way of a multiplexed packet according to the present invention the step of filtering comprising the steps of: encrypting the multiplexed multi-stream, and may include the step of de-multiplexing in response to the encrypted multiple streams in the multi-channel. 본 발명의 일실시예에 따르면, 다운로더블 제한수신 시스템을 지원하는 호스트 장치를 통하여 멀티 채널을 통해 수신되는 다수 개의 프로그램을 녹화할 수 있다. According to one embodiment of the invention, it can be through the host device to support double the conditional access system to download recording a plurality of programs received through a multi-channel. 또한, 본 발명의 일실시예에 따르면, 멀티 채널에 대한 디스크램블링된 트랜스포트 스트림(transport stream)을 다중 스트림으로 멀티플렉싱하고, 멀티플렉싱된 다중 스트림을 암호화하며, 암호화된 다중 스트림을 멀티 채널에 대응하여 디멀티플렉싱하는 다중 스트림 암호화 장치 및 그 방법이 제공된다. Further, according to one embodiment of the present invention, it is multiplexing the descrambled transport stream (transport stream) for multiple channels in a multi-stream, and encodes the multiplexed multi-stream, in response to an encrypted multi-stream multi-channel the de-multiplexing multiple streams encryption apparatus and method is provided. 이하 첨부된 도면을 참조하여 본 발명의 일실시예에 따른 멀티 채널 녹화를 위한 다중 스트림 암호화 방법, 다중 스트림 암호화 장치 및 호스트 장치를 상세히 설명한다. Reference to the accompanying drawings a multi-stream encryption method for multi-channel recording, and multi-stream encryption device and a host device according to an embodiment of the present invention will be described in detail. 본 발명의 일실시예들을 설명함에 있어서, 관련된 공지 기능 또는 구성에 대한 구체적인 설명이 본 발명의 요지를 불필요하게 흐릴 수 있다고 판단되는 경우에는 그 상세한 설명을 생략할 것이다. In the following description of an embodiment of the present invention, a detailed description of known functions and configurations that are determined to unnecessarily obscure the subject matter of the present invention, a detailed description thereof will be omitted. 그리고, 본 명세서에서 사용되는 용어(terminology)들은 본 발명의 바람직한 실시예를 적절히 표현하기 위해 사용된 용어들로서, 이는 사용자, 운용자의 의도 또는 본 발명이 속하는 분야의 관례 등에 따라 달라질 수 있다. And, the terms (terminology) that are used herein as a term used to adequately represent the preferred embodiments of the present invention, and can be changed according to users, operator's intention or custom of the field to which the invention pertains. 따라서, 본 용어들에 대한 정의는 본 명세서 전반에 걸친 내용을 토대로 내려져야 할 것이다. Therefore, the definitions of the terms should be made according to throughout the present specification. 본 발명의 일실시예에 따른'호스트 장치'또는 '호스트'는 다운로드 가능한 클라이언트를 DCAS 규격에 따라 SM(Secure Micro)에 지원할 수 있는 셋탑박스(Set-top Box)와 같은 장치를 통칭하고, '호스트 장치'또는 '호스트'는 다운로드가능한 제한수신시스템을 지원하기 위하여 DOCSIS/DSG eCM, SM 드라이버 및 제한수신네트워크 핸들러를 포함하는 것으로 정의한다. "Host devices" or "host" in accordance with one embodiment of the present invention is downloaded in accordance with the available clients on DCAS specification collectively refer to devices such as set-top boxes (Set-top Box) that can be supported on (Secure Micro) SM, and ' the host device, "or" host "is defined to include DOCSIS / DSG eCM, SM driver and conditional access network handlers to support a downloadable conditional access system. 또한, 본 발명의 '보안모듈 클라이언트'는 'ASD 클라이언트', 'CA 클라이언트', 및 'DRM 클라이언트'를 포함하는 것으로 정의한다. Further, "client security module, of the present invention is defined to include" ASD client "," client CA ", and" DRM client. 또한, 본 발명의 인증기관, 인증서버 및 보안모듈사이에 송수신되는 메시지에 대한 규약 및 절차에 관한 통신 메커니즘을 DCAS(Downloadable Conditional Access System) 프로토콜이라 정의한다. Further, the communication mechanism of the terms and procedures for the message to be sent and received between the certificate authority of the present invention, the authentication server and the security module is defined as (Downloadable Conditional Access System) DCAS protocol. 도 1은 본 발명의 일실시예에 의한 다운로더블 제한수신시스템에서 DVR(digital video recorder) 기능을 지원하는 호스트 장치의 구성을 도시한 블록 도이다. 1 is a block diagram showing the configuration of a host apparatus that supports the DVR (digital video recorder) function in a double conditional access system to download according to one embodiment of the present invention. 본 발명의 일실시예에 의한 호스트 장치(100)는 케이블 네트워크(170)를 통하여 인증기관(도시되지 아니함)으로부터 호스트 인증 정보를 수신하여, 상기 수신된 호스트 인증 정보를 기반으로 보안모듈 프로그램에 대한 유효성을 검증하며, 상기 보안모듈 프로그램의 유효성 검증 정보에 대한 호스트 상태 정보를 포함하는 호스트상태정보 메시지를 헤드엔드 시스템(도시되지 아니함)의 인증서버(도시되지 아니함)로 전송한다. The host apparatus 100 according to an embodiment of the present invention receives the host authentication information from the certificate authority (SHALL not shown) via a cable network 170, based on the received host credentials for the security module program and sends the host status information message to validate, and includes a host status information for the validation information of the security module program to the authentication server (sHALL not shown) of the head-end system (sHALL not shown). 호스트 장치(100)의 보안 모듈부(120)는 상기 헤드엔드 시스템의 인증서버와 인증 및 유효성 검증에 필요한 정보를 관리하기 위해 케이블 사업자가 아닌 제3의 인증기관을 활용함으로써, 고객 댁내 장치(CPE, Consumer Premise Equipment)(도시되지 아니함)에 개선된 비디오 및 미디어 기술을 보호하기 위한 보안모듈 프로그램을 호스트 장치(100)로 공급할 수 있다. Security module 120 of the host apparatus 100 by utilizing the third of the certificate authority rather than the cable operator to manage the information required for the authentication server and the authentication and validation of the head-end system, the customer premises equipment (CPE , Consumer Premise equipment) (it is possible to supply the security module program for the protection of the video and media technology to improve SHALL not shown) to the host apparatus 100. 도 1을 참조하면, 본 발명의 일실시예에 의한 호스트 장치(100)는 변조부(110), 보안 모듈부(120), 및 DVR 저장부(130)를 포함할 수 있다. 1, the host device according to an embodiment of the present invention 100 may include a modulation unit 110, a security module 120, and the DVR storage unit 130. 변조부(110)는 멀티 채널을 통한 통신 데이터를 수신하여 상기 멀티 채널에 대한 트랜스포트 스트림(transport stream)을 복조하여 출력할 수 있다. Modulator 110 may be output to and receives communication data via the multi-channel demodulating a transport stream (transport stream) on the multichannel. 실시예에 따라서는 변조부(110)는 방송 채널 튜닝과 QAM 복조의 기능을 담당할 수도 있다. Depending upon the embodiment modulator 110 may be responsible for the function of the broadcast channel tuning and QAM demodulation. 보안 모듈부(120)는 변조부(110)로부터 출력되는 상기 멀티 채널에 대한 트랜스포트 스트림을 수신하여 디스크램블링하고, 상기 디스크램블링된 트랜스포트 스트림을 암호화할 수 있다. Security module 120 may de-receives the transport stream for the multi-channel output from modulation section 110, scrambling and encrypting the descrambled transport stream. 실시예에 따라서는 보안 모듈부(120)는 보안모듈 클라이언트 중 CA(conditional access) 클라이언트를 통하여 상기 멀티 채널에 대한 트랜스포트 스트림으로부터 컨트롤 워드(이하 'CW(control word)' 라 한다) 및 CCI(copy control information) 정보를 추출하고, 상기 보안모듈 클라이언트 중 ASD 클라이언트를 통하여 상기 추출된 CCI 정보로부터 암호화 키를 생성하는 시큐어 마이크로 프로세서부(220, 이하 'SM(secure micro)'이라 한다)를 포함할 수 있다. Example In some security module 120 includes security module client of the CA (conditional access) via the client control word from a transport stream to the multi channel (more than 'CW (control word)' referred to), and CCI ( comprise a copy control information) and extracts the information and, as the security module a secure microprocessor unit through the client ASD client of generating the encryption key from the extracted CCI information 220 (hereinafter 'SM (secure micro)') can. 또한, 실시예에 따라서는 보안 모듈부(120)는 상기 CW를 이용하여 상기 멀티 채널에 대한 트랜스포트 스트림을 디스크램블링하고, 상기 암호화 키를 이용하여 상기 디스크램블링된 트랜스포트 스트림을 암호화하는 트랜스포트 프로세서부(210, 이하 'TP(transport processor)'라 한다)를 포함할 수 있다. Further, according to the embodiment is a security module 120 includes a transport scrambling using the CW D a transport stream for the multi-channel, encrypting the descrambled transport stream using the encryption key, It may include (referred to 210 and less than 'TP (transport processor)') processor unit. DVR 저장부(130)는 보안 모듈부(120)를 통하여 암호화된 상기 트랜스포트 스트림을 레코딩하여 저장할 수 있다. DVR storage unit 130 may store the recording of the transport stream encrypted through the security module 120. 본 발명의 일실시예에 따른 호스트 장치(100)는 DCAS 프로토콜 관련 메시지와 보안모듈 클라이언트를 포함한 방송부가데이터를 송수신하는 케이블 모뎀(140), 압축된 A/V 신호를 복원하는 디코더부(150), 호스트 장치(100) 내의 구성요소들의 대한 제어와 각 구성들간 전달되는 메시지의 라우팅을 제어하는 DCAS 매니저(160)를 더 포함할 수 있다. Host device 100 in accordance with one embodiment of the present invention, the cable modem 140, a decoder unit 150, which restores the compressed A / V signal for transmitting and receiving broadcast and additional data including the DCAS protocol-specific messages and the security module, the client It may further include a DCAS manager 160 for controlling the routing of messages that are passed between the control and the configuration for each of the components in the host apparatus 100. 본 발명의 일실시에 따른 호스트 장치(100)는 다음과 같은 절차로 구동될 수 있다. Host device 100 in accordance with one embodiment of the present invention it can be driven with the following procedures. 호스트 장치(100)에 전원이 인가되면, 보안 모듈부(120)는 호스트 인증을 위한 프로세스를 진행하고, 인증 프로세스가 정상적으로 완료된 후, 보안 모듈부(120)에 저장되어 있는 보안모듈 클라이언트에 대한 호스트 상태 정보를 확인할 수 있다. When the host device 100 is powered, the security module 120 is the host of the security module, the client that is stored on and then proceed to the process for host authentication, the authentication process is completed normally, the security module 120 You can check the status information. 상기 보안모듈 클라이언트의 다운로드가 필요한 경우, 인증서버(도시되지 아니함)로 상기 보안모듈 프로그램의 다운로드 요청을 하고, 케이블 모뎀(140)을 통해 상기 보안모듈 프로그램을 수신할 수 있다. If the download of the client security module is required, the authentication server (SHALL not shown) may receive the security module via the program download request, the cable modem 140 of the security module program. 상기 수신된 보안모듈 프로그램은 보안 모듈부(120)에 저장되어 실행될 수 있다. The received security module program may be executed is stored in the security module 120. 케이블 네트워크(170)를 통하여 연결된 헤드엔드 시스템은 인증기관으로부터 호스트 장치(100)에 대한 유효성 검증 정보를 포함하는 유효성확인 메시지를 수신하고, 호스트 장치(100)의 보안 모듈부(120)로 호스트 장치(100)에 대한 상기 유효성 검증 정보에 대응하는 호스트 인증 정보를 포함하는 호스트인증 메시지를 전송하는 인증서버를 포함할 수 있다. Connected through the cable network 170, the head-end system to the security module 120 of receiving a confirmation message validation including the validation information to the host device 100 from the certificate authority, and the host device 100, the host apparatus It may be about 100, an authentication server sending the authentication message, the host including a host authentication information corresponding to the validation information. 상기 인증서버는 상기 인증기관으로부터 전송 받은, 인증에 필요한 세션키 생성을 위한 정보 및 호스트 인증 정보를 케이블모뎀종단시스템(CMTS, Cable Modem Termination System)을 경유하여 보안 모듈부(120)로 전송할 수 있다. The authentication server may transmit to the information and a host authentication information to the via the cable modem termination system (CMTS, Cable Modem Termination System), a security module 120 for session key generation for receiving the authentication transmitted from the certificate authority . 또한, 상호 인증 과정에서 발생하는 모든 키 정보는 상기 헤드엔드 시스템의 키 관리 서버에서 관리될 수 있다. In addition, all of the key information generated in the mutual authentication process may be managed in the key management server of the headend system. 따라서, 상기 보안모듈 클라이언트를 다운로드(또는 업데이트)한 보안 모듈부(120)는 스크램블되어 전송되는 방송 신호에 대한 시청허가를 획득하여 가입자에게 고객 댁내 장치를 통해 유료방송 서비스를 제공할 수 있다. Therefore, the download client to the security module (or update) a security module section 120 to obtain the scramble is allowed to watch broadcasting signal transmitted it is possible to provide a pay-TV service through the customer premises equipment to a subscriber. 전술한 바와 같이 본 발명의 SM(220)에서 구동될 수 있는 보안모듈 클라이언트는 ASD 클라이언트, CA 클라이언트, 및 DRM 클라이언트를 포함하는 것으로 정의 한 바 있다. The client security module which can be driven in the SM (220) of the present invention as described above, which had defined to include ASD client, CA client, and the DRM client. 실시예에 따라서는 SM(220)에서 구동될 수 있는 상기 CA 클라이언트는 트랜스 멀티 채널에 대한 트랜스포트 스트림을 디스크램블하기 위해 요구되는 키 정보를 비롯한 스크램블 방식 및 초기화 정보 등을 TP(210)에게 제공하여, TP(210)가 디스크램블링을 수행하도록 할 수 있다. Depending upon the embodiment above, which can be driven in the SM (220) CA client service such as scrambled, including the key information required to descramble the transport stream scheme and initialization information for the trans multi channel to TP (210) and it may be a TP (210) to perform descrambling. 또한, 실시예에 따라서는 SM(220)에서 구동될 수 있는 상기 ASD 클라이언트는 디스크램블링된 트랜스포트 스트림을 암호화하여 녹화하도록 하기 위해 TP(210)로 상기 암호화에 사용될 키 정보를 전송할 수 있다. Further, in accordance with an embodiment, it may transmit the key information used in the encryption by TP (210) to ensure that the ASD client which can be driven in the SM (220) is recorded by encrypting the descrambled transport stream. 이후, TP(210)는 상기 ASD 클라이언트로부터 수신한 암호화 키를 이용하여 트랜스포트 스트림을 암호화할 수 있다. Since, TP (210) may encrypt the transport stream by using an encryption key received from the ASD client. 본 발명의 일실시예에 의한 호스트 장치(100)를 통하여 멀티 채널에 대응하는 트랜스포트 스트림은 DVR 저장부(130)에 암호화되어 저장될 수 있다. A transport stream corresponding to the multi-channel through the host apparatus 100 according to one embodiment of the present invention can be stored encrypted on the DVR storage unit 130. 상기 저장된 트랜스포트 스트림을 재생하기 위해서는 상기 ASD 클라이언트는 복호화 키 정보를 TP(210)로 전송할 수 있다. In order to reproduce the stored transport stream the ASD client can send the decryption key information to a TP (210). 또한, TP(210)는 수신한 복호화 키 정보를 이용하여 DVR 저장부(130)에서 출력되는 암호화된 트랜스포트 스트림을 복호화하고, 디코더부(150)는 복호화된 트랜스포트 스트림을 A/V 신호로 복원할 수 있다. Further, TP (210) is a by using the decryption key information receiving and decoding an encrypted transport stream output from the DVR storage unit 130, and decoder 150 decodes the transport stream to the A / V signals It can be restored. 이하에서는 멀티 채널에 대한 트랜스포트 스트림을 암호화하는 구성을 상세히 설명하기로 한다. Hereinafter will be described in detail a configuration of encrypting the transport stream for the multi-channel. 도 2는 본 발명의 일실시예에 의한 호스트 장치에 포함될 수 있는 보안 모듈부의 구성을 도시한 블록도이다. 2 is a block diagram showing the configuration parts of the security module, which may be included in the host apparatus according to an embodiment of the present invention. 도 2를 참조하면, 본 발명의 일실시예에 의한 보안 모듈부(120)는 보안모듈 클라이언트 중 CA 클라이언트(241)를 통하여 멀티 채널에 대한 트랜스포트 스트림으로부터 CW 및 CCI 정보를 추출하고, 보안모듈 클라이언트 중 ASD 클라이언트(242)를 통하여 상기 CCI 정보로부터 암호화 키(K ASD )를 생성하는 SM(210)을 포함할 수 있다. 2, the security module 120 according to one embodiment of the present invention extracts the CW and the CCI information from the transport stream to the multi-channel via the security module, the client CA client 241 of the security module, of the client from the CCI information via the ASD client 242 may include SM (210) for generating an encryption key (K ASD). 또한, 실시예에 따라서는 보안 모듈부(120)는 CA 클라이언트(241)로부터 수신한 상기 CW를 이용하여 상기 멀티 채널에 대한 트랜스포트 스트림을 디스크램블링하고, ASD 클라이언트(242)로부터 수신한 상기 암호화 키(K ASD )를 이용하여 상기 디스크램블링된 트랜스포트 스트림을 암호화하는 TP(210)를 포함할 수 있다. In addition, depending the security module 120 to CA by using the above CW received from the client 241, and descrambling the transport stream for the multi channel, the encrypted received from the ASD client 242 in embodiment key can be used for (K ASD) comprises a TP (210) for encrypting the descrambled transport stream. 실시예에 따라서는 TP(210)는 SM(220)의 CA 클라이언트(241)로부터 수신한 상기 CW를 이용하여 상기 멀티 채널에 대한 트랜스포트 스트림을 디스크램블링하는 CA 디스크램블러(211)를 포함할 수 있다. Depending upon the embodiment TP (210) may include the SM (220), a CA descrambler 211 using the CW for descrambling the transport stream for the multi-channel received from the CA client 241 of the have. 또한, 실시예에 따라서는 TP(210)는 SM(220)의 ASD 클라이언트(242)로부터 수신한 상기 암호화 키(K ASD )를 이용하여 CA 디스크램블러(211)로부터 수신한 상기 디스크램블링된 트랜스포트 스트림을 암호화하는 ASD 암호화부(310)를 포함할 수 있다. In addition, according to an embodiment, the TP (210) is one of the encryption key (K ASD) by using the said descrambled transport received from the CA descrambler 211 is received from the ASD client 242 of the SM (220) ASD may include the encryption section 310 to encrypt the stream. 또한, 실시예에 따라서는 TP(210)는 ASD 클라이언트(242)로부터 수신한 복호화 키(K ASD )를 이용하여 상기 DVR 저장부로부터 출력되는 상기 암호화된 트랜스포트 스트림을 복호화하는 ASD 복호화부(213)를 포함할 수도 있다. Further, depending upon the embodiment TP (210) is a decryption key ASD decoding unit (213 to use the (K ASD) decrypting the encrypted transport stream output from the DVR storage unit received from the ASD client 242 ) may include. 상술한 과정을 보다 구체적으로 설명하면, 변조부(110)에서 출력되는 트랜스포트 스트림은 TP(210)로 입력될 수 있고, TP(210)의 CA 디스크램블러(211)는 변조부로부터 수신한 상기 트랜스포트 스트림으로부터 시청 자격(entitlement)과 관련된 ECM(Entitlement Control Message) 패킷을 필터링할 수 있다. Referring to the above process more specifically, a transport stream output from the modulator 110 can be input to the TP (210), CA descrambler 211 of the TP (210) is one received from the modulator it can filter the ECM (Entitlement Control Message) packet related to the viewing qualification (entitlement) from the transport stream. 상기 필터링된 ECM은 SM(220)의 CA 클라이언트(241)로 전송될 수 있다. The filtered ECM may be sent to the CA client 241 of the SM (220). 본 발명에서의 TP(210)와 SM(220) 간 전송되는 모든 메시지는 DCAS 매니저(160)에서 라우팅될 수 있다. All messages sent between TP (210) and the SM (220) in the present invention may be routed from the DCAS manager 160. 실시예에 따라서는 CA 클라이언트(241)는 CA 디스크램블러(211)로부터 수신한 상기 ECM에서 CW 및 CCI를 추출하여, 상기 CW는 CA 디스크램블러(211)로 전송하고, 상기 CCI는 ASD 클라이언트(242)로 전송할 수 있다. Embodiment CA client 241 according to the example of CA extracts the CW and CCI in a the ECM received from the descrambler 211, the CW is the CCI transmitted, and a CA descrambler 211 ASD client (242 ) it can be transferred to. 또한, 실시예에 따라서는 CA 디스크램블러(211)는 상기 CW를 이용하여 변조부(110)로부터 입력되는 트랜스포트 스트림을 디스크램블링 할 수 있다. Further, in accordance with an embodiment, may descramble the transport stream input from the modulation section 110 using the CW is the CA descrambler 211. 또한, 실시예에 따라서는, 상기 디스크램블링된 트랜스포트 스트림은 디코더부(260)에서 복원될 수 있고, 녹화를 위해 ASD 암호화부(310)로 입력될 수 있다. Further, depending upon the embodiment, the de-scrambling the transport stream can be restored in the decoder unit 260, may be input to the ASD encryption unit 310 for recording. 또한, 실시예에 따라서는 CA 클라이언트(241)로부터 상기 CCI를 수신한 ASD 클라이언트(242)는 상기 CCI의 복제방지 정책에 따라 프로그램 스트림을 녹화, 즉 트랜스포트 스트림을 저장하기 위해 ASD 암호화부(310)로 암호화 키(K ASD )를 전송할 수 있다. In addition, depending will record a program stream according to the copy protection policy of the CCI, i.e. ASD encryption unit (310 to store the transport stream on ASD client 242 receiving the CCI from the CA client 241 in embodiment ) as may transmit the encryption key (K ASD). 또한, 실시예에 따라서는 ASD 암호화부(310)는 ASD 클라이언트(242)로부터 수신한 상기 암호화 키(K ASD )를 이용하여 CA 디스크램블러(211)로부터 수신되는 트랜스포트 스트림을 암호화 할 수 있고, 상기 암호화된 트랜스포트 스트림은 DVR 저장부(130)에 저장될 수 있다. According to an embodiment also, the ASD encryption unit 310 may encrypt the transport stream that is received from the CA descrambler 211 using the encryption key (K ASD) received from the ASD client 242, It said encrypted transport stream may be stored in the DVR storage unit 130. 또한, 실시예에 따라서는 DVR 저장부(130)에 저장된 트랜스포트 스트림은 재생을 위해 ASD 복호화부(213)로 출력될 수 있다. In addition, according to an embodiment, is a transport stream stored in the DVR storage unit 130 may be output to the ASD decoding unit 213 for playback. ASD 복호하부(213)에서는 DVR 저장부(130)로부터 수신된 상기 트랜스포트 스트림을 복호화하기 위해 ASD 클라이언트(242)로부터 복호화 키(K ASD )를 수신할 수 있다. The decoded lower ASD 213 may receive a decryption key (K ASD) ASD from the client 242 to decode the transport stream received from the DVR storage unit 130. 또한, 실시예에 따라서는 ASD 복호화부(213)는 ASD 클라이언트(242)로부터 수신한 상기 복호화 키를 이용하여 상기 암호화된 트랜스포트 스트림을 복호화하여 디코더부(150)로 출력할 수 있고, 디코더부(150)는 상기 복호화된 트랜스포트 스트림을 복원하여 A/V 신호를 출력할 수 있다. In addition, depending ASD decoding unit 213 may output to the decoder section 150 to decrypt the encrypted transport stream using the decoding key received from the ASD client 242, a decoder unit in the embodiment 150 may output the a / V signal by restoring the decoded transport stream. 이하에서는 멀티 채널에 대한 트랜스포트 스트림을 암호화하기 위한 호스트 장치의 구성을 상세히 설명하기로 한다. Hereinafter will be described in detail a configuration of a host device for encrypting the transport stream for the multi-channel. 도 3은 본 발명의 일실시예에 따른 TP 의 ASD 암호화부의 구성을 도시한 블록도이다. 3 is a block diagram showing the configuration of the ASD encrypted portion TP in accordance with one embodiment of the present invention. 도 3을 참조하면, 본 발명의 일실시예에 따른 TP(210 의 ASD 암호화부(310)는 멀티플렉싱부(410), 필터부(312), 암호화부(313), 및 디멀티플렉싱부(410)를 포함할 수 있다. 3, the exemplary TP (210 of the ASD encryption unit (310 according to the embodiment of the present invention) is a multiplexing unit 410, a filter unit 312, an encryption unit 313, and demultiplexing unit 410 It may contain. 멀티플레싱부(410)는 멀티 채널에 대한 상기 디스크램블링된 트랜스포트 스 트림을 다중 스트림으로 멀티플렉싱(multiplexing)할 수 있고, 필터부(312)는 상기 멀티플렉싱된 다중 스트림에 대한 PSI(program specific information) 테이블을 포함하는 TS(transport stream) 패킷을 필터링할 수 있으며, 암호화부(313)는 상기 필터링된 다중 스트림을 암호화할 수 있다. Multiplexing portion 410 to the de-scrambled transport stream for the multi-channel may be multiplexed (multiplexing) to the multi-stream, the filter unit 312 (program specific information) PSI for multiple streams of the multiplexed to filter out TS (transport stream) packet including a table, and encryption unit 313 may encrypt the multi-stream of the filter. 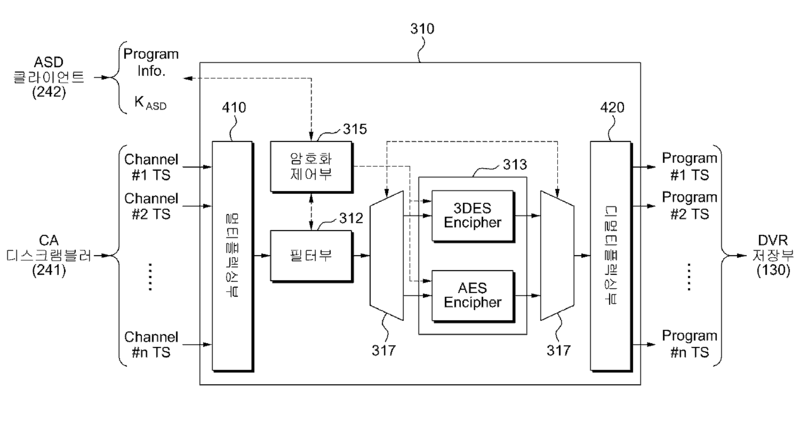 실시예에 따라서는 암호화부(313)는 Triple-DES(Data Encryption Standard) 암호화를 지원하는 3DES 암호화기, AES(Advanced Encryption Standard) 암호화를 지원하는 AES 암호화기를 포함할 수 있고, .상기 3DES 암호화기 및 상기 AES 암호화기를 통하여 방송 사업자 별로 ASD를 위한 암호화 방식의 선택이 가능하다. Example In some encryption unit 313 may comprise an AES encryption to support encryption Triple-DES (Data Encryption Standard) based 3DES encryption that support encryption, (Advanced Encryption Standard), AES,. The 3DES encrypter and it is possible to select the encryption method for ASD by the broadcaster via an AES encryption. 이러한 선택을 위해 ASD 암호화부(310)는 해당 암호화기의 입출력을 제어하기 위한 스위칭부(317)를 더 포함할 수도 있다. For this selection ASD encryption unit 310 may further include a switching unit 317 for controlling the input and output of the encryptor. 또한, 디멀티플렉싱부(410)는 상기 암호화된 다중 스트림을 상기 멀티 채널에 대응하여 디멀티플렉싱(demultiplexing)할 수 있다. In addition, the demultiplexing unit 410 may de-multiplexing (demultiplexing) corresponding to the encrypted multiple streams in the multi-channel. 본 발명의 일실시예에 따른 ASD 암호화부(310)는 ASD 클라이언트(242)로부터 상기 멀티 채널에 대한 트랜스포트 스트림에 대응하는 정보 또는 암호화 키를 수신하고, 상기 멀티플렉싱된 다중 스트림의 암호화를 제어하고, ASD 클라이언트(242)와 통신하는 암호화 제어부(315), 및 상기 멀티 채널에 대한 상기 디스크램블링된 트랜스포트 스트림에 대응하는 PCR(packet clock reference)의 지터를 보상하기 위한 클럭 카운터를 발생하는 카운터부(도시되지 아니함)을 더 포함할 수도 있다. ASD encryption unit 310 according to an embodiment of the present invention includes receiving the information or the encryption key corresponding to the transport stream for the multi-channels from the ASD client 242, and controls the encryption of the multiplexed multi-stream, and , ASD client 242 and the communication encryption control section 315, and a counter for generating a clock counter for compensating for jitter in the PCR (packet clock reference) corresponding to the transport stream of the descrambling for the multiple channels It may further include (SHALL not shown). 실시예에 따라서는 상기 카운터부는 다중화로 인한 타이밍 지터 보상을 위해 27MHz MPEG 클럭 카운터를 발생할 수 있다. Thus the embodiment can generate a 27MHz MPEG clock counter for timing jitter compensation due to the first multiplexer unit and the counter. 또한, 실시예에 따라서는 필터부(312)는 암호화 제어부(315)로부터 수신한 상기 멀티 채널에 대한 트랜스포트 스트림에 대응하는 프로그램 정보를 기반으로 상기 멀티플렉싱된 다중 스트림을 필터링하여 상기 TS 패킷을 출력할 수 있다. Further, according the filter unit 312 filters the multiple streams of the multiplexed based on the program information corresponding to the transport stream for the multi-channel received from the encryption control unit 315 outputs the TS packet to the embodiment can do. 또한, 실시예에 따라서는 상기 멀티플렉싱된 다중 스트림은 멀티 채널에 대한 트랜스포트 스트림을 식별하기 위한 스트림 식별 정보(Local TSID), 및 상기 PCR의 지터를 보상하기 위한 로컬 타임(local time) 정보로 구성된 프리헤더 정보를 포함할 수 있고, 암호화부(313)는 상기 스트림 식별 정보 및 PID 정보를 기반으로 ASD 클라이언트로부터의 암호화 키를 이용하여 필터링된 다중 스트림을 암호화할 수 있다. In addition, the multiple streams of the multiplexed according to the embodiment is configured as a local time (local time) information for compensating for jitter in the stream identification information (Local TSID), and the PCR for identifying the transport stream for a multichannel may include a pre-header information, the encryption unit 313 may encrypt the multi-stream is filtered using the encryption key from the client based on the ASD the stream identification information and the PID information. 또한, 실시예에 따라서는 디멀티플렉싱부(420)는 상기 로컬 타임 정보를 기반으로 PCR의 지터를 보상할 수 있고, 상기 PCR의 지터가 보상된 상기 암호화된 다중 스트림의 상기 프리헤더 정보를 제거할 수 있으며, 상기 스트림 식별 정보를 기반으로 상기 암호화된 다중 스트림을 상기 멀티 채널에 대응하여 디멀티플렉싱할 수 있다. In addition to the embodiment according the demultiplexing unit 420 is able to compensate for jitter of PCR is based on the local time, to remove the pre-header information of the encrypted multiple streams of the PCR jitter is compensated number, and can be de-multiplexing in response to a multi-stream the encrypted based on the stream identification information to the multi-channel. 또한, 실시예에 따라서는 디멀티플렉싱부(420)는 트랜스포트 스트림의 제1 TS 패킷에 대한 제1 로컬 타임 정보 및 제2 TS 패킷에 대한 제2 로컬 타임 정보로부터 산출되는 로컬 타임 차이 정보와, 제1 TS 패킷에 대한 카운터부로부터의 제1 클럭 카운터 정보 및 제2 TS 패킷에 대한 상기 카운터로부터의 제2 클럭 카운터 정보로부터 산출되는 클럭 카운터 차이 정보를 비교하여 상기 PCR 의 지터를 보상할 수 있다. In addition, depending demultiplexing unit 420, the embodiment is the local time difference information that is calculated from the second local time for a first local time and the second TS packet for the first TS packet of the transport stream, it is possible to by comparing the first clock counter information and the second clock count difference information that is calculated from the second clock counter information from the counter of the TS packet from the counter unit compensating for jitter in the PCR for the first TS packet . 이에 대해서는 도 7에서 보다 상세히 후술하기로 한다. As it will be described later in more detail in FIG. SM(220)의 ASD 클라이언트(242)에서 ASD 암호화부(300)에 대한 초기화 메시지가 암호화 제어부(315)로 수신되면, 암호화 제어부(315)는 상기 초기화 메시지를 해석하여 암호화부(313)에서 어떤 암호화기가 사용될 것인지를 결정하고 해당 암호화기를 초기화할 수 있다. When the ASD client 242 of the SM (220) the initialization message for the ASD encryption unit 300 receives the encryption control section 315, the encryption control unit 315 in the encryption unit 313 which analyzes the initiation message determining whether encrypted group to be used and can initiate an appropriate encryption. 실시예에 따라서는, 암호화 제어부(315)는 ASD 클라이언트(242)로부터 멀티 채널의 각각의 채널에서 녹화하고자 하는 프로그램에 대한 프로그램 정보(Local TSID, PMT PID, A/V PIDs) 및 암호화 키(K ASD )를 수신할 수 있다. Depending upon the embodiment, the encryption control unit 315 ASD program information from the client 242 to the program to be recorded on each channel of a multi-channel (Local TSID, PMT PID, A / V PIDs) and Encryption Key (K you can receive ASD). 또한, 실시예에 따라서는 암호화 제어부(315)는 ASD 클라이언트(242)로부터 수신한 채널 별 녹화 프로그램 정보를 필터부(312)로 전송하여 필터부(312)를 세팅할 수 있다. In addition, according to an embodiment, the encryption control unit 315 may set a filter unit 312 transmits the channel information to the recorded program filter unit 312 received from the ASD client 242. 본 발명의 일실시예에 따른 멀티플렉싱부(410)는 CA 디스크램블러(241)로부터 멀티 채널 각각에 따른 디스크램블링된 트랜스포트 스트림을 수신하여 입력 받아 하나의 단일 스트림으로 멀티플렉싱하여 다중 스트림을 출력할 수 있고, 상기 멀티플렉싱 과정에서는 각 채널별 트랜스포트 스트림을 구분하고, 다중화로 인하여 PCR(Packet Clock Reference)의 지터를 보정할 필요가 있다. Multiplexing section 410 in accordance with one embodiment of the present invention can output a multi-stream by receiving by receiving the descrambled transport stream in accordance with the multi-channel respectively from the CA descrambler 241 is multiplexed into a single stream of and, in the multiplexing process, it is necessary to correct the jitter of PCR (Packet Clock Reference), and separate each channel transport stream, due to multiplexing. 이를 위해 멀티플렉싱부(410)는 각각의 멀티 채널에 대한 트랜스포트 스트림의 TS 패킷에 대하여 프리헤더 정보를 추가할 수 있다. To this end, the multiplexing unit 410 may add the pre-header information to the TS packet of the transport stream for each of the multiple channels. 상기 프리헤더 정보는 멀티 채널에 대한 트랜스포트 스트림을 식별하기 위한 스트림 식별 정보(Local TSID), 및 PCR의 지터를 보상하기 위한 로컬 타임(local time) 정보를 포함할 수 있음은 전술한 바와 같다. The pre-header information, which may include a local time (local time) information for compensating for jitter in the stream identification information (Local TSID) for identifying the transport stream for a multichannel, and PCR are as described above. 이하에서는 TS 패킷에 삽입될 수 있는 프리헤더 정보에 대해서는 도 4를 참조하여 보다 상세히 설명하기로 한다. In reference now to Figure 4 for the pre-header the information that can be inserted into the TS packet will be described in more detail. 도 4는 본 발명의 일실시예에 따른 다중 스트림의 TS 패킷의 구조를 도시한 것이고, 4바이트로 구성된 프리헤더 정보가 4비트의 Local TSID 와 28비트의 로컬 타임 정보로 구성된 경우를 예시한 것이다. Figure 4 is an illustration of a case consisting of a local time of a multi will stream showing the structure of a TS packet, the pre-header information is 4 bits of the Local TSID and 28 bits consisting of four bytes according to an embodiment of the present invention . 도 4를 참조하면, TS 패킷에 삽입되는 프리헤더 정보는 스트림 식별 정보(이하 'Local TSID'라 한다), 로컬 타임 정보(local time)를 포함할 수 있고, Local TSID(Transport Stream ID)는 멀티 채널에 대한 트랜스포트 스트림이 하나의 다중 스트림으로 멀티플렉싱 되더라도 상기 다중 스트림을 형성하는 각각의 TS 패킷이 어떤 채널의 패킷인지를 구분하기 정보라 할 수 있다. 4, (hereinafter referred to as the 'Local TSID') pre-header information is inserted into the TS packet, the stream identification information, and may include a local time (local time), (Transport Stream ID) Local TSID multi the transport stream of the channel, even if multiplexed into a single multi-stream, there is each TS packet to form the multiple streams may be referred to distinguish whether a packet of a channel information. 실시예에 따라서는 상기 Local TSID는 TS 헤드의 PID 정보와 더불어 필터부(312)에서 수행될 수 있는 TS 패킷에 대한 필터링을 위해 이용될 수 있고, 디멀티플랙서(306)에서는 디멀티플렉싱 과정 중 이용될 수 있다. Depending upon the embodiment of the Local TSID may be used for the filtering of the TS packets that can be carried out in a filter unit 312 with the PID information of the TS head, the demultiplexer 306 demultiplexes the process It can be used. 다시 도 3을 참조하면, 필터부(312)는 필터부(312)의 세팅 과정에서 암호화 제어부(315)로부터의 멀티 채널 별로 녹화하기 위한 프로그램 정보를 기반으로 세팅 과정을 수행할 수 있다. Referring again to Figure 3, the filter unit 312 may perform the setting process of the program based on the information for recording by the multi-channels from the encryption control unit 315 in the setting process of the filter unit 312. 또한, 필터부(312)는 다중화 스트림을 상기 멀티 채널 의 채널 별로 트랜스포트 스트림을 필터링 한다. The filter unit 312 filters the transport stream for each channel of the multi channel a multiplexed stream. 실시예에 따라서는 필터부(312)는 패킷의 프리헤더 정보에 포함된 스트림 식별 정보로 멀티 채널 별 각 채널을 구분하며, 구분된 해당 채널의 PID가 0인 패킷, 즉 PAT(Program Associate Table) 테이블을 가진 패킷, PMT PID를 가진 패킷, 또는 A/V PIDs를 가진 패킷들을 출력할 수 있다. According to an embodiment includes a filter unit 312 separates the multi-channel for each channel to the stream identification information contained in the pre-header information of the packet, the PID of separated the channel 0 the packet, that is, PAT (Program Associate Table) may output the packet having the packet with the packet, PMT PID with a table, or the a / V PIDs. 또한, 실시예에 따라서는 필터부(312)를 통해 출력된 필터링된 다중 스트림은 스위칭부(317)에 의해 설정된 경로를 통해 암호화부(313)의 3DES 암호화기 또는 AES 암호화기로 입력될 수 있고, 3DES 암호화기 또는 AES 암호화기는 상기 필터링된 다중 스트림의 패킷들에 대해 프리헤더 정보의 스트림 식별 정보(Local TSID) 및 TS 헤더의 PID 정보를 이용하여 암호화를 수행할 수 있다. In Examples In some multi-stream output filtered by the filter unit 312 may be input group 3DES encrypter or AES encryption of the encryption unit 313 via the path set by the switching section 317, 3DES encrypter or AES cryptographic group may perform encryption using the PID information of the free stream, the identification information (Local TSID) and the TS header of the header information for the packets of the multiple streams of the filter. 이 경우, 암호화부(313)는 A/V PID를 가진 패킷들에 대해서만 암호화를 수행할 수 있고, 상기 암호화에 사용되는 암호화 키 값은 멀티 채널별 각각마다 상이할 수 있다. In this case, the encryption unit 313 may perform encryption only to the packet with the A / V PID, an encryption key value used for the encryption may be different for each specific multi-channel. 실시예에 따라서는 암호화부(313)를 통하여 출력되는 상기 암호화된 다중 스트림은 스위칭부(317)를 통하여 디멀티플렉싱부(420)로 출력될 수 있고, 디멀티플렉싱부(420)는 상기 암호화된 다중 스트림의 각 패킷들을 프리헤더 정보를 이용하여 상기 멀티 채널별로 디멀티플렉싱 한다. Example In some the encrypted multi-stream output by the encryption unit 313 may be output to the demultiplexing unit 420 via the switching section 317, demultiplexing section 420 is the encrypted multiple each packet in the stream by using the pre-header information is demultiplexed by the multichannel. 이 경우, 실시예에 따라서는 디멀티플렉싱부(420)는 상기 디멀티플렉싱 과정에서 패킷의 프리헤더 정보에 포함된 로컬 타임 정보를 이용하여 PCR를 포함하는 TS 패킷을 찾아 PCR 지터를 보정한 이후, 상기 암호화된 다중 스트림으로부터 프리 헤더 정보를 제거한 상기 암호화된 다중 스트림을 출력할 수 있다. Since in this case, therefore, the demultiplexing unit 420 by using the local time information contained in the pre-header information of the packet to find a TS packet including the PCR corrects the PCR jitter in the demultiplexing process in the embodiment, the removal of the pre-header information from the encrypted multiple streams may output a multi-stream the encrypted. 도 5는 본 발명의 일실시예에 따른 멀티플렉싱부의 구성을 도시한 블록도이다. Figure 5 is a block diagram showing a structure multiplexing section in accordance with one embodiment of the present invention. 도 5를 참조하면, 본 발명의 일실시예에 의한 멀티플렉싱부(410)는 TS 수신부(411), 프리헤더 생성부(412), 및 출력 선입선출부(FIFO)(413, 이하, '출력 FIFO'라 한다)를 포함할 수 있다. 5, the multiplexing section 410 according to one embodiment of the present invention the TS receiver 411, a pre-header generating unit 412, and output first-in-first-out unit (FIFO) (413, hereinafter, the output FIFO It may include and La). TS 수신부(411)는 멀티 채널에 대한 디스크램블링된 트랜스포트 스트림을 채널 별로 수신할 수 있다. TS receiving unit 411 may receive the descrambled transport stream to the multi-channel according to the channel. 실시예에 따라서는 '제1 TS 수신부'는 채널 #1의 디스크램블링된 트랜스포트 스트림을 수신할 수 있다. According to the embodiment, the first TS receiver, may receive the descrambled transport stream of the channel # 1. 또한, '제2 TS 수신부'는 채널 #2의 디스크램블링된 트랜스포트 스트림을 수신할 수 있고, 제n TS 수신부'는 채널 #n의 디스크램블링된 트랜스포트 스트림을 수신할 수 있다. Further, 'No. 2 TS reception' DI can receive the scrambled transport stream, a TS n of the receiving channel # 2 'may receive the descrambled transport stream of the channel #n.
프리헤더 생성부(412)는 프리헤더 정보를 생성하여 TS 수신부(411)로부터 수신된 상기 디스크램블링된 트랜스포트 스트림에 상기 프리헤더 정보를 삽입하여 출력할 수 있다. Pre-header generating unit 412 may generate a pre-header information, and outputs the insertion of the pre-header information to the de-scrambled transport stream received by the TS receiver (411). 실시예에 따라서는 '제1 프리헤더 생성부'는 '제1 TS 수신부'로부터 수신된 채널 #1의 디스크램블링된 트랜스포트 스트림에 프리헤더 정보를 삽입할 수 있다. In some embodiments, the first pre-header generating unit "in the pre-header may be inserted into the information to the descrambled transport stream of the channel # 1 is received from, the first TS receiver. 또한, 제2 프리헤더 생성부'는 '제2 TS 수신부'로부터 수신된 채널 #2의 디스크램블링된 트랜스포트 스트림에 프리헤더 정보를 삽입할 수 있고, 제n 프리헤더 생성부'는 '제n TS 수신부'로부터 수신된 채널 #n의 디스크램블링된 트랜스포트 스트림 에 프리헤더 정보를 삽입할 수 있다. In addition, the second pre-header generating unit "is the" second "can be inserted into the pre-header information in the descrambled transport stream of the channel # 2 received from the n pre-header generating unit" TS receiving unit, the n It can be inserted into the pre-header information in the transport stream TS receiving the descrambling of the received channel #n from. 또한, 실시예에 따라서는, 프리헤더 생성부(412)를 통하여 출력되는 프리헤더 정보가 삽입된 디스크램블링된 트랜스포트 스트림은, 도 4에서 전술한 바와 같이 4 바이트의 프리헤더 정보가 부착되어 192 바이트의 패킷 형태로 출력될 수 있다. Also the pre-header information of 4 bytes attached as, and thus, the free-free transport stream header information is inserted in the descrambled output through the header generation unit 412 for example is described above in Fig. 4 192 It may be output to the packet in the form of bytes. 또한, 여기서 프리헤더 정보의 로컬 타임 정보는 도 3의 카운터부로부터 수신한 현재의 클럭 카운터 값이 기록될 수 있다. In addition, where the local time of the pre-header information may be a clock counter value of the current received from the counter of Fig recording. 출력 FIFO(413)는 프리헤더 생성부(412)로부터 출력되는 상기 채널 별 상기 디스크램블링된 트랜스포트 스트림을 수신하여 소정의 순서로 출력하여 다중 스트림으로 다중화할 수 있다. Output FIFO (413) may receive the transport stream, the de-scrambled by the channel outputted from the pre-header generating unit 412 to multiplex the multi-stream to the output in a predetermined order. 또한, 실시예에 따라서는 '제 1 출력 FIFO'는 '제1 프리헤더 생성부'로부터 출력되는 채널 #1의 디스크램블링된 트랜스포트 스트림을 수신할 수 있다. Further, according to the embodiments may receive the descrambled transport stream of the channel # 1 are output from the 'first output FIFO "is a" first pre-header generating unit. 또한, '제 2 출력 FIFO'는 '제2 프리헤더 생성부'로부터 출력되는 채널 #2의 디스크램블링된 트랜스포트 스트림을 수신할 수 있고, '제 n 출력 FIFO'는 '제n 프리헤더 생성부'로부터 출력되는 채널 #n의 디스크램블링된 트랜스포트 스트림을 수신할 수 있다. In addition, the "second output FIFO, is able to receive the descrambled transport stream of the channel # 2 is outputted from the" second pre-header generating unit ', and' the n-th output FIFO "is" n-th pre-header generator 'you may receive the descrambled transport stream of the channel #n output from. 또한, 본 발명의 일실시예에 따른 멀티플렉싱부(410)는 출력 FIFO(413)에서 출력되는 패킷들이 충돌하지 않도록 제어하는 FIFO 제어부(414)를 더 포함할 수도 있다. In addition, the multiplexing unit 410 according to an embodiment of the present invention may further comprise a FIFO control 414 to control so as not to packets being output from the output FIFO (413) collision. 실시예에 따라서는 출력 FIFO(413)는 FIFO 제어부(414)에게 현재 저장된 데이터의 바이터 수를 매 클럭마다 전달할 수 있다. Performed according to an output FIFO (413) for example, it may deliver the water by-emitter current of the stored data to the FIFO control 414 on every clock. 이 경우, FIFO 제어부(414)는 도 4의 경우를 예시하자면 192 바이트가 저장된 제1 출력 FIFO로 출력하라는 제어 신호를 상기 제1 출력 FIFO로 전달할 수 있고, 192 클럭이 지난 후에 제2 출력 FIFO에 저장된 바이트 수가 192 이상인지를 확인하여 제2 출력 FIFO에 출력하라는 제어 신호를 전달할 수 있다. In this case, gritty FIFO control 414 is illustrated in the case of Figure 4, and 192 bytes can deliver a control signal to output to the first output FIFO is stored into the first output FIFO, the second output FIFO after 192 clock last to determine whether the stored number of bytes is at least 192 may communicate a control signal to output to the second output FIFO. 이를 통하여 각 출력 FIFO에서 출력되는 패킷들이 서로 충돌하는 것을 막을 수 있다. This packet is output from each output FIFO via they can be prevented from colliding with each other. 도 6은 본 발명의 일실시예에 따른 디멀티플렉싱부의 구성을 도시한 블록도이다. 6 is a diagram showing the structure demultiplexing section in accordance with one embodiment of the present invention. 도 6을 참조하면, 본 발명의 디멀티플렉싱부(420)는 프리헤더 체크부(421), 입력 선입선출부(422), 및 PCR 보상부(423)을 포함할 수 있다. 6, the demultiplexing unit 420 of the present invention may comprise a pre-header checking unit 421, an input first-in-first-out portion 422, and the PCR compensation unit 423. 프리헤더 체크부(421)는 암호화된 다중 스트림에 포함된 프리헤더 정보로부터 멀티 채널에 대한 트랜스포트 스트림을 식별하기 위한 Local TSID를 분석할 수 있다. Pre-header checking unit 421 may analyze the Local TSID for identifying the transport stream for multiple channels from the multiple streams that are included in the encrypted pre-header information. 입력 선입선출부(422)는 상기 분석된 Local TSID를 기반으로 상기 암호화된 다중 스트림을 상기 멀티 채널에 대응하여 상기 암호화된 다중 스트림을 역다중화할 수 있다. Input first-in-first-out portion 422 may be demultiplexed to multiple streams the encrypted response to the encrypted multiple streams based on the analyzed Local TSID to the multichannel. 즉, 입력선입선출부(422)는 암호화된 다중 스트림으로부터 프리헤더 정보를 포함한 TS 패킷의 시작을 찾고, 상기 TS 패킷의 시작 바이트부터 제1 입력 FIFO에 저장한 후, 제1 입력 FIFO에 192 TS 패킷(프리-헤더 포함)이 저장되면 동작 클럭에 동기시켜 데이터 블록 형태로 출력할 수 있고, 제2 입력 FIFO 내지 제n 입력 FIFO 에 대해서도 동일한 과정이 수행될 수 있다. That is, the input first-in-first-out unit 422 is a searching for the beginning of the TS packet including the pre-header information from the encrypted multiple streams, stored in the first input FIFO from the start byte of the TS packet and then, the 192 TS to the first input FIFO packet-If (pre including header) is stored in synchronization with the operation clock can be output with the data block type, the FIFO has a second input to the n-th process, even for the same input FIFO may be performed. 또한, PCR 보상부(423)는 프리헤더 정보 및 클럭 카운터를 기반으로 상기 PCR의 지터를 보상할 수 있다. In addition, PCR compensation unit 423 may compensate for the jitter of the PCR based on the pre-header information and the clock counter. 이하에서는 PCR 보상부에 의해 수행되는 PCR 지터 보상 과정을 상세히 설명하기로 한다. Hereinafter will be described a PCR jitter compensation process performed by the PCR compensation unit in detail. 도 7은 본 발명의 일실시예에 따른 PCR 보상 과정을 설명하기 위해 도시한 것이다. 7 is a diagram to explaining PCR compensation process according to one embodiment of the present invention. 디멀티플렉싱부(420)는 암호화된 다중 스트림의 제1 TS 패킷(previous PCR Packet)에 대한 제1 로컬 타임 정보 및 제2 TS 패킷(Current PCR Packet)에 대한 제2 로컬 타임 정보로부터 산출되는 로컬 타임 차이 정보와, 상기 제1 TS 패킷에 대한 카운터부로부터의 제1 클럭 카운터 정보 및 제2 TS 패킷에 대한 상기 카운터로부터의 제2 클럭 카운터 정보로부터 산출되는 클럭 카운터 차이 정보를 비교하여 PCR 의 지터를 보상할 수 있다. De-multiplexing unit 420 is the local time that is calculated from the second local time for a first local time and the second TS packet for the first TS packet (previous PCR Packet) of the encrypted multiple streams (Current PCR Packet) the difference information and, for a first clock counter information and the second jitter of PCR by comparing the clock counter difference information that is calculated from the second clock counter information from the counter of the TS packet from the counter for the first TS packet It can be compensated. 즉, 디멀티플랙서(420)는 PCR을 포함하는 제1 TS 패킷(Previous PCR Packet)이 검색되면 프리헤더 정보의 제1 로컬 타임 정보(T i-1 )와 제1 클럭 카운터 정보(C i-1 )를 기록하고, 다음에 검색되는 PCR을 포함하는 제2 TS 패킷(Current PCR Packet)에서 프리헤더 정보의 제2 로컬 타임 정보(T i )와 그 때의 클럭 카운터 정보(C i )를 이용하여 (C i - C i-1 ) 와 (T i - T i-1 )의 차이로부터 PCR 의 보상 여부를 결정할 수 있다. That is, the demultiplexer 420 is the first TS packet including a PCR (Previous PCR Packet) If the retrieval of the pre-header information, a first local time (T i-1) and the first clock counter information (C i -1) for the record, the second TS packet (packet Current PCR), a second local time (T i) and the clock counter information (C i) at the time of the pre-header information including a PCR is retrieved in the following used in (C i - C i-1 ) , and - from a difference (T i T i-1) can determine whether or not the compensation PCR. 실시예에 따라서는 디멀티플랙서(420)는 (C i - C i-1 ) 와 (T i - T i-1 )의 차이가 0 이 아닌 경우에는 지터(jitter)가 발생한 것으로 판단하여 (C i - C i-1 ) 와 (T i - T i-1 )의 차이만큼 PCR을 보상 할 수 있다. Example In some demultiplexer 420 (C i - C i-1 ) - is determined to have occurred if the difference (T i-1 T i) not zero jitter (jitter) (with C i - C i-1) and (T i - can compensate for PCR by the difference between T i-1). 도 8은 본 발명의 일실시예에 따른 다중 스트림 암호화 방법을 설명하기 위한 흐름도이다. 8 is a flowchart illustrating a multi-stream encryption method according to an embodiment of the present invention. 도 8을 참조하면, 본 발명의 일실시예에 의한 다중 스트림 암호화 방법은 ASD 클라이언트로부터 초기화 메시지를 수신하여 암호화부를 초기화할 수 있다(S810). 8, a multiple stream encryption method according to an embodiment of the present invention may initialize the encryption unit receives the initialization message from the ASD client (S810). 단계(S810)은 SM(220)의 ASD 클라이언트(242)에서 ASD 암호화부(300)에 대한 초기화 메시지가 암호화 제어부(315)로 수신되면, 암호화 제어부(315)는 상기 초기화 메시지를 해석하여 암호화부(313)에서 어떤 암호화기가 사용될 것인지를 결정하고 해당 암호화기를 초기화하는 과정에 대응될 수 있다. Step (S810) is when the initialization message is received, the encryption control unit 315 of the ASD encryption unit 300 in the ASD client 242 of the SM (220), the encryption control unit 315 is part encrypted by analyzing the initiation message at 313 determines which encryption group will be used, and may correspond to the process of initializing an encryption. 또한, 본 발명의 일실시예에 의한 다중 스트림 암호화 방법은 상기 ASD 클라이언트로부터 멀티 채널에 대응하는 트랜스포트 스트림에 대한 프로그램 정보 및 암호화 키를 수신할 수 있다(S820). In addition, the multi-stream encryption method according to one embodiment of the present invention can receive the program information and the encryption key for the transport stream corresponding to the multi-channels from the ASD client (S820). 단계(S820)은 암호화 제어부(315)가 ASD 클라이언트(242)로부터 멀티 채널의 각각의 채널에서 녹화하고자 하는 프로그램에 대한 프로그램 정보(Local TSID, PMT PID, A/V PIDs) 및 암호화 키(K ASD )를 수신하는 과정에 대응될 수 있다. Step (S820) the encrypted control unit 315, the ASD program information from the client 242 to the program to be recorded on each channel of a multi-channel (Local TSID, PMT PID, A / V PIDs) and the encryption key (K ASD ) it may correspond to receiving a. 또한, 본 발명의 일실시예에 의한 다중 스트림 암호화 방법은 상기 프로그램 정보로부터 필터부를 설정할 수 있다(S830). In addition, the multi-stream encryption method according to an embodiment of the present invention can set the filter unit from the program information (S830). 또한, 본 발명의 일실시예에 의한 다중 스트림 암호화 방법은 멀티플렉싱부를 통하여 멀티 채널에 대응하는 트랜스포트 스트림을 다중 스트림으로 멀티플렉싱하고(S840), 상기 멀티플레싱된 다중 스트림의 TS 패킷을 필터링할 수 있다(S850). In addition, the multi-stream encryption method according to an embodiment of the present invention can filter the TS packets of multiple streams multiplexed to the transport stream into multiple streams, and (S840), the multiplexing corresponding to the multi-channel by way of a multiplex (S850). 또한, 본 발명의 일실시예에 의한 다중 스트림 암호화 방법은 상기 멀티플렉싱된 다중 스트림을 암호화하고(S860), 상기 암호화된 다중 스트림을 상기 멀티 채널에 대응하여 디멀티플렉싱할 수 있다(S870). In addition, it is possible to multi-stream encryption method according to an embodiment of the present invention is to de-multiplexing in response to said multiplexed encrypted multiple streams, and (S860), the encrypted multi-stream to the multi channel (S870). 본 발명의 일실시예에 따른 다중 스트림 암호화 방법은 다양한 컴퓨터 수단을 통하여 수행될 수 있는 프로그램 명령 형태로 구현되어 컴퓨터 판독 가능 매체에 기록될 수 있다. Multi-stream encryption method according to an embodiment of the present invention is implemented in program instruction form that can be executed by various computer means to be recorded in computer-readable media. 상기 컴퓨터 판독 가능 매체는 프로그램 명령, 데이터 파일, 데이터 구조 등을 단독 또는 조합하여 포함할 수 있다. The media may also include, alone or in combination with the program instructions, data files, data structures, and the like. 상기 매체에 기록되는 프로그램 명령은 본 발명을 위하여 특별히 설계되고 구성된 것들이거나 컴퓨터 소프트웨어 당업자에게 공지되어 사용 가능한 것일 수도 있다. The media and program instructions may be ones, or they may be of well-known and available to those skilled in the art computer software specifically designed and constructed for the purposes of the present invention. 컴퓨터 판독 가능 기록 매체의 예에는 하드 디스크, 플로피 디스크 및 자기 테이프와 같은 자기 매체(magnetic media), CD-ROM, DVD 와 같은 광기록 매체(optical media), 플롭티컬 디스크(floptical disk)와 같은 자기-광 매체(magneto-optical media), 및 롬(ROM), 램(RAM), 플래시 메모리 등과 같은 프로그램 명령을 저장하고 수행하도록 특별히 구성된 하드웨어 장치가 포함된다. Examples of the computer readable recording medium such as an optical recording medium (optical media), flop tikeol disk (floptical disk) such as a magnetic medium (magnetic media), CD-ROM, DVD, such as hard disks, floppy disks, and magnetic tape - hardware devices that are specially configured to store the program instructions, such as an optical medium (magneto-optical media), and read-only memory (ROM), random access memory (RAM), flash memory and perform. 상기 매체는 프로그램 명령, 데이터 구 조 등을 지정하는 신호를 전송하는 반송파를 포함하는 광 또는 금속선, 도파관 등의 전송 매체일 수도 있다. The media may also be a transmission medium such as optical or metallic lines, wave guides, etc. including a carrier wave transmitting signals specifying the program instructions, data, etc. Structure. 프로그램 명령의 예에는 컴파일러에 의해 만들어지는 것과 같은 기계어 코드뿐만 아니라 인터프리터 등을 사용해서 컴퓨터에 의해서 실행될 수 있는 고급 언어 코드를 포함한다. Examples of program instructions include both machine code, such as produced by a compiler, using an interpreter for a high-level language code that can be executed by a computer. 상기된 하드웨어 장치는 본 발명의 동작을 수행하기 위해 하나 이상의 소프트웨어 계층으로서 작동하도록 구성될 수 있으며, 그 역도 마찬가지이다. The described hardware devices may be configured to act as one or more software layers in order to perform the operations of the present invention, or vice versa. 도 1은 본 발명의 일실시예에 의한 다운로더블 제한수신시스템에서 DVR(digital video recorder) 기능을 지원하는 호스트 장치의 구성을 도시한 블록도이다. 1 is a block diagram showing the configuration of a host apparatus that supports the DVR (digital video recorder) function in a double conditional access system to download according to one embodiment of the present invention. 도 4는 본 발명의 일실시예에 따른 다중 스트림의 TS 패킷의 구조를 도시한 것이다. Figure 4 illustrates the structure of a TS packet of a multi-stream according to an embodiment of the present invention. 를 포함하는 호스트 장치. The host device comprising a. 를 포함하는 것을 특징으로 하는 호스트 장치. The host device comprising: a. 상기 암호화 제어부로부터 수신한 상기 멀티 채널에 대한 트랜스포트 스트림에 대응하는 프로그램 정보를 기반으로 상기 멀티플렉싱된 다중 스트림을 필터링하여 상기 TS 패킷을 출력하는 것을 특징으로 하는 호스트 장치. The host device, characterized in that for outputting the TS packets to filter out the multiplexed multiple streams based on the program information corresponding to the transport stream for a the multi-channel received from the encryption control section. 상기 스트림 식별 정보 및 PID 정보를 기반으로 상기 암호화 키를 이용하여 상기 필터링된 다중 스트림을 암호화하는 것을 특징으로 하는 호스트 장치. The host device, characterized in that coding for the multiple streams of the filter by using the encryption key, based on the stream identification information and the PID information. 상기 로컬 타임 정보를 기반으로 상기 PCR 지터를 보상하며, 상기 PCR 지터가 보상된 상기 암호화된 다중 스트림의 상기 프리헤더 정보를 제거하며, 상기 스트림 식별 정보를 기반으로 상기 암호화된 다중 스트림을 상기 멀티 채널에 대응하여 디멀티플렉싱하는 것을 특징으로 하는 호스트 장치. The local time compensating for the PCR jitter to the information based on, and the PCR jitter, and removing the pre-header information of the compensated the encrypted multi-stream, the multi-stream the encrypted based on the stream identification information multichannel host device characterized in that the de-multiplexing in response to the. 를 비교하여 상기 PCR 의 지터를 보상하는 것을 특징으로 하는 호스트 장치. By a host and wherein for compensating for jitter in the PCR comparison. 를 포함하는 것을 특징으로 하는 다중 스트림 암호화 장치. Multi-stream encryption device comprising: a. 를 더 포함하는 것을 특징으로 하는 다중 스트림 암호화 장치. A multi-stream encryption device according to claim 1, further comprising. 를 포함하는 것을 특징으로 하는 다중 스트림 암호화 방법. Multi-stream encryption method comprising: a. 를 더 포함하는 것을 특징으로 하는 다중 스트림 암호화 방법. A multi-stream encryption method according to claim 1, further comprising.